Most narrators are emphatic that girls and boys are treated equally nowadays and that they personally appreciate daughters as much as sons. Yet the story related by one of the younger narrators (China 3) is a vivid illustration of the belief - which her father held - that "boys are more valuable than girls". The interview is full of human detail, and is particularly revealing about attitudes towards girls' education, being essentially the tale of a young woman battling prejudice to become a teacher. Minority peoples as a whole have faced a real struggle to get education, and the women even more so, but virtually all narrators are fiercely determined that their own children - boys and girls - will stay in school as long as they can afford it. A young Lahu woman (China 16) who has become an Oxfam extension worker is full of ideas for practical developments and exhibits a great thirst for knowledge. She, like others, makes the point that farming today - which is primarily women's work - requires more scientific knowledge than before. And now that they can market their produce, numeracy and business skills are crucial too. Several have clearly developed such skills despite little formal education, though low literacy and prejudice against women "being the boss" remains a limitation, as one explains: "…a woman can only go to sell if her husband's dad goes together with her or if she goes with other people… If we want to buy rice, his dad will go to sell some corn and buy the rice back. We women dare not to do business…" (China 13). Another woman (China 11) says: "I cannot read and write. [But] as I have been managing the money matters of the family for all these years, I have to go to the market and I learned how to count and read [money]." Her illiterate husband, she says, leaves it to her and "just asks for money to buy one packet of cigarettes". Yet: "He's a man so he has authority. If he wants to buy something [at the market] that I disagree with, he'll insist. I can't stop him." Gender relations in these interviews seem often quite strained. While a few women acknowledge good treatment by their husbands, the majority feel unappreciated at best, and face varying levels of domestic tension, including violence, at worst. All say they carry the heaviest workloads, and certainly the descriptions of their tasks bear witness to this. The men's harsh lives clearly add to the problems, and many, it seems, resort to alcohol for comfort. A significant number of narrators acknowledge that not only is this a drain on meagre family resources, but it is at the heart of much domestic violence. A sad and revealing interview with one woman (China 11) underlines this: "I don't know what's wrong these days. We old women chatted and found that everyone has been beaten. Everyone beats when they are drunk. It is not only my man who beats. I said, 'Yi, the alcohol, I'm afraid that we shouldn't blame the person but the alcohol…'. There are many [man] - Miao, Han, Yi - all beat [their wives] when they get drunk." 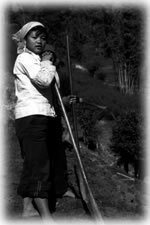 In one of the few interviews with a man (China 18), there is an intriguing discussion on domestic violence, with the male Miao Oxfam extension worker saying it affects just one or two families in a hundred, and his female interviewer exclaiming that the women's accounts suggest something very different. He then makes a distinction between "when the man beats the woman for everything all the time" and the "kinds of quarrels and fights in a family" which he considers "normal things". Xiao, his interviewer, sounds unconvinced. "Men go out to earn money; women bear the workload of housework and livestock rearing." "Although I am a woman, I want to learn how to drive. I want to drive and I want to build houses. If someone could support me [to do it], I want to buy a truck. I would repay the money. If someone could support me for one year, I want to raise pigs"
"[Women] become old very quickly… Many men in our village don't work much; women work more. Women provide the main labour of the family here…. The wife rears pigs and chickens, and makes money out of them. They use the money together. Sometimes the man goes out to work and earns some money…In our village, mostly it's men who keep the money. But in my family, [my husband] lets me keep it." "If I went and depended on you (my husband) for my living, you would say I'm useless. I don't want to depend on you for my living. I work hard at home and earn more than you do as a cadre (government employee). Soya beans yield 250 kg and red beans 100 kg per year. Now the piglets I reared earn me 1000 yuan. A thousand yuan!" "Now men and women are equal… You can do any business you like if you have the ability to do it. And women receive more care. There are rarely any women who are abused and cursed. If this was not because of the [concern] from the government, how could it be like this? Besides, with the help of family planning, women are more relaxed." "Women bear more. Men only help with the work when it's the busy season for planting. At other times, all the work is done by women. Men go out [or the village] to other places to work… [Women] are not just hardworking; they work themselves to death." "In the rural areas, no matter which ethnic group you belonged to, if a family had only girls, other people would look down on them because they couldn't have a son."